Set on the banks of Privassion Creek, our Waterfall Spa offers a variety of treatments, wraps, and massages, as well as access to our rejuvenating hot pool overlooking cascading waterfalls. 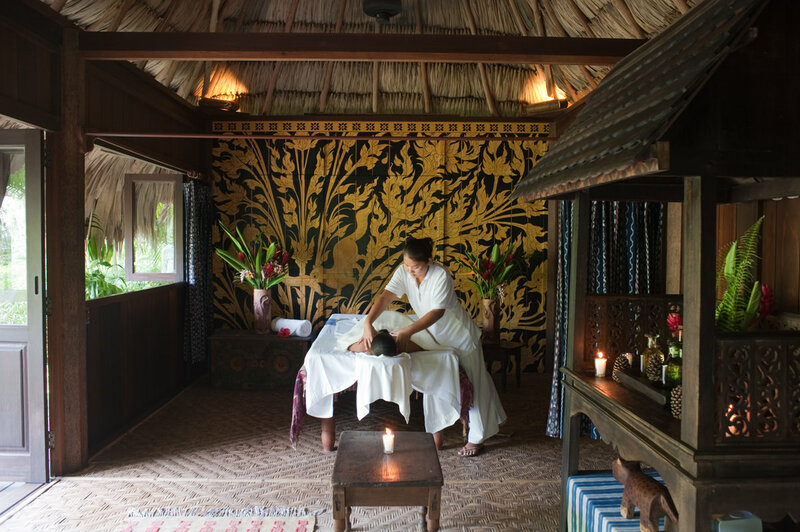 At the request of Francis Ford Coppola, our Belize spa specializes in the art of Thai massage, and features a professionally trained staff that has studied ancient techniques at the Sacred Wat Pho Temple in Bangkok. 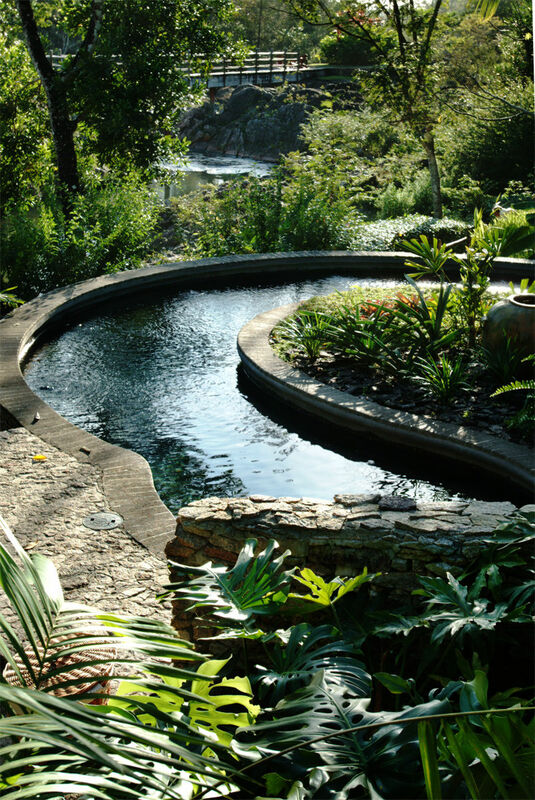 With a hot pool heated solely by hydroelectricity, spa treatments that use locally sourced organic ingredients, and an open building design utilizing natural light, the Waterfall Spa is eco-luxury at its best. Find out more about our Belize conservation efforts today. The naturally occurring fruit acid within the papaya gently removes the dead skin cells from the body leaving it feeling refreshed. The body is covered in the warm fruit while enveloped with fluffy towels which allows the body heat to encourage the exfoliating benefit of the treatment. A special combination of bananas and a blend of honey sprinkled with salt crystals are directly applied onto the wrap and the body. The warm mixture encourages the body’s absorption of the fruit acid and the exfoliation process begins on the entire body, while the honey and banana extract nourishes. Salt crystals help in the removal of dead skin cells, leaving your body extra soft and cleansed. A combination of herbs combined with honey is scrubbed over your entire damp body to exfoliate dead skin cells, increase circulation, nourish your skin, and leave you feeling extra smooth. This is also ideal before a relaxing massage. A body scrub treatment where salt crystals calm the body, relax muscles, and ease aches and pains. This leaves skin smooth with a natural healthy glow. Your entire body receives a rejuvenating sense of well being. Ideal after a day hiking the trails or climbing Maya ruins. An ancient Thai healing treatment using herbal packs, this treatment begins with a gentle body scrub on damp skin to remove dead skin cells. The body is then compressed with a warm special herbal pack on the areas that need healing. A special massage of healing techniques eases muscle tension and pains. A mix of herbal tea and honey is applied over the body which is then wrapped in a thermal blanket, followed by a scrub. This is good for detoxifying and exfoliating dead skin cells. Your skin will be extra soft and cleansed. The tea and honey nutrients are absorbed into the skin to re-energize it. 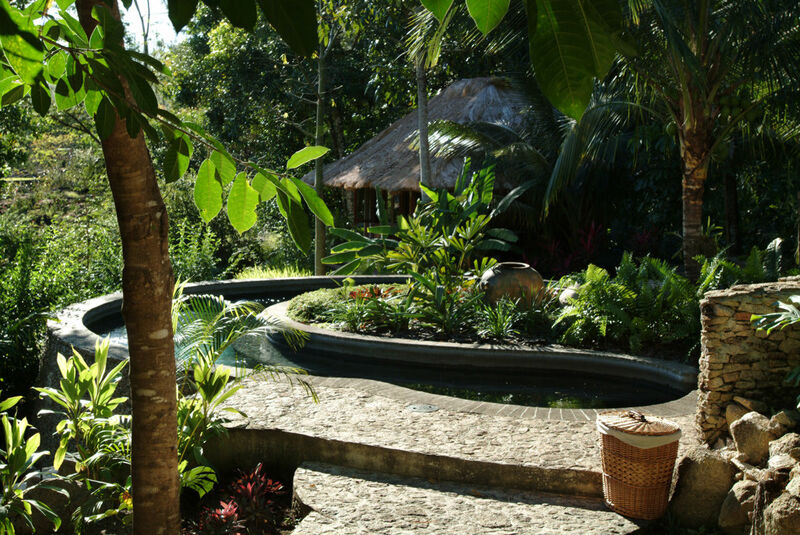 This is followed by an essential oil massage, which will make you feel totally relaxed. This is a traditional Thai massage. Wearing Siamese style pajamas, the entire body from scalp to toe benefits from the pressure point massage and stretching movements. Blends of essential oils extracted from plants release their soothing properties into the skin during this face, scalp, and body massage. This eases muscle tension and releases energy with acupressure movements, which is perfect for easing stress. All the energy meridians of the body are identified in the pressure points of the foot. Massaging the feet provides relaxation, soothes pain, and releases blocked energy. This is the ideal treatment after sightseeing. A massage to treat the upper part of the body with aromatic oil and pressure point technique. The richness of minerals and amino acid in the mud are detoxifying and increase oxygen absorption for a refining and smoothing effect.